“We are confident our diesel services can solve inherent diesel issues such as deposit buildup and drivability. So confident, in fact, that we’re covering diesels of any age, mileage, or hours,” says Marketing Director Mike Moen. To maintain coverage, consumers must simply return to the BG shop for another BG Diesel Performance Oil Change Service within the specified mileage interval. Plan 1: First service performed either before 50,000 miles (80,000 km), or 1,500 hours, whichever comes first. *To enter Plan 2, diesel owners must purchase four BG diesel services to restore performance of the fuel, lubrication and emissions systems. Visit the BG Forever Diesel™ page to learn more about this program. BG products are proven to make vehicles last longer and perform better. In a recent national survey, dealerships said they use BG Products as their supplier of fluid maintenance service products and equipment by a margin of nearly 3 to 1 over any other supplier,including OEMs. In partnership with an international network of distributors, BG serves the driving public with innovative automotive maintenance products backed by the Lifetime BG Protection Plan. 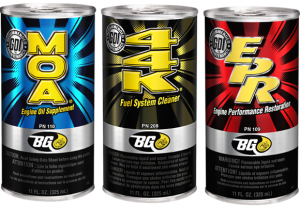 Press Release BG Corporate Offices WICHITA, Kan.–January 1, 2016–BG Products, Inc., has created BG Extended Life MOA,PN 115, oil supplement to help engine oil protect components over longer oil change intervals. BG Extended Life MOA® is formulated with 100 percent synthetic chemistry to protect engine components and fortify all brands of engine oil at extended oil change intervals! The market is pushing for longer drain intervals, putting 10,000 miles (16,000 km) – some as high as 15,000 miles (24,000 km)– of road wear between shop visits. These extended interval recommendations are quickly becoming the norm in owner’s manuals. Unfortunately, longer time between oil changes puts a lot more strain on engine oil. Today’s vehicles have hotter combustion temperatures, higher cylinder pressures, less ring tension and tighter tolerances than ever before. This volatile environment is conducive to deposit formation and buildup. Add extended oil change intervals and these engines provide a lengthy incubation period for carbon deposits. Even high quality synthetic oils will degrade eventually. Unless the oil is fortified, premature and hard-to-remove deposits will form on many engine components. The potent detergency and antioxidant system in BG Extended Life MOA® prevents engine oil degradation and thickening under even the most severe stop-and-go, high temperature driving. Visit our Engine catalog page to learn about all of our engine products. BG products are proven to make vehicles last longer and perform better. In a recent national survey, dealerships said they use BG Products as their supplier of fluid maintenance service products and equipment by a margin of nearly 3 to 1 over any other supplier, including OEMs. Diesel fuel (even ULSD) is notorious for producing large amounts of particulate matter (soot). Regularly burning this soot-juice in a diesel engine can take a toll, leaving unburned hydrocarbons throughout the intake and emissions system. The diesel particulate filter’s (DPF) primary job is to remove the soot from the exhaust gas, to reduce air pollution. We all know what happens when soot collects in the induction system (performance and fuel efficiency drop), but what happens when soot collects in the DPF? In most cases, it’s not just a matter of changing out a single-use filter. The DPF is designed to capture and burn off collected soot; this is called regeneration. In regeneration mode, the fuel injection timing is adjusted, exhaust temperature increases and ideally, the unburned hydrocarbons are, well, burned. To achieve the high temperatures necessary for the DPF to go into regeneration, the diesel vehicle must be driven at speeds exceeding 40 mph (64 km/h) for an extended period. This presents a problem for vehicles primarily driven in urban traffic—where the vehicle experiences excessive idling and may never travel consistently above 40 mph (64 km/h)—therefore never regenerating the DPF, which can be catastrophic to the component. The common solution has been to remove and attempt to clean or replace parts altogether, which is costly, unsafe and inefficient as the problem will recur eventually. Many vehicles have even been recalled due to large amounts of soot trapped in the DPF, causing flames to emit from the exhaust pipe, turning emissions systems into blast furnaces! David Tenpenny, BG Technical Service Advisor, says, “People in the diesel industry realize this is a real problem that’s not going away and if you want to solve it, you have to fix what’s causing it. If not, you’re just applying a Band-Aid.®” Which, Tenpenny adds, has been the case for every other “solution” so far. The BG Technology Department saw this problem as an opportunity, and after two years of research and development, became the first to market with a viable solution. The BG DPF & Emissions System Restoration Service uses groundbreaking technology to restore the DPF, while simultaneously performing an effective intake system cleaning. With the touch of a button and the turn of a knob, the BG 12Q VIA,™ PN 9300, is the first piece of equipment to have the ability to command and control regeneration, which is key to cleaning the emissions system. Installed through the BG 12Q VIA,™ the BG DPF & Emissions System Restoration, PN 258, effectively disperses hydrocarbons from the intake all the way through to the emissions system to be burned off and sent out the tailpipe. According to David, careful temperature monitoring, adjusting RPM and patience are the key to a successful service. Particulate matter will always be present in diesel engines because it’s a byproduct of combustion. BG has the solution to keep particulate matter from decreasing diesel engine performance or killing a DPF. As a matter of fact, preventive maintenance with BG will greatly minimize the production of particulate matter, which will prolong the life of the engine and DPF system. Published Originally in Fall 2014 Blend’r. CAFE (Corporate Average Fuel Economy) standards will save new 2016 car buyers $4,000 in gas over the lifetime of the vehicle, say government analysts. In 2011, the Obama administration and vehicle manufacturers (OEMs) agreed on a CAFE fleet mandate of 54.5 MPG by 2025, OEMs must innovate to achieve the ever-growing number of miles a car or truck can travel on one gallon of gas. However, in addition to the improved fuel efficiency, consumers rightfully demand the same power and torque. These market needs have caused rapid development in the automotive industry. OEMs are combining technologies—variable valve timing, hydraulic actuation, low tension piston rings and gasoline direct injection—to achieve a goal of small-engine efficiency with big-engine power. In an effort to increase engine efficiency, automakers use Variable Valve Timing (VVT). In traditional 4-stroke engines, the intake and exhaust valves raise and lower at predetermined intervals. Driving conditions, or component operation variations, do not affect the rate at which the valves move. Just as the name indicates, with VVT, the timing of the valve lift event (raising and lowering of the intake and exhaust valves) varies depending on RPM level, the piston’s current location and the valves’ current positions. VVT is controlled by the cam phaser through hydraulic actuation. The cam phaser receives information from the Engine Control Unit (ECU), the engine’s computer. The goal with VVT is to achieve optimum efficiency (at high and low RPM torque), increase fuel economy and reduce emissions. As with many new technologies powered by hydraulic actuation, cam phaser functionality can be easily disrupted by fluid degradation. Engine oil integrity, oil filter flow-capacity and extended drain intervals can affect the ability of the cam phaser to control valve timing. Hydraulic actuation is the process of converting power/pressure into mechanical motion using fluid. The lubrication system supplies power to turbochargers, timing chain tensioners and cam phase actuators, reducing the need for bulky, heavy mechanical parts. Hydraulic actuation improves fuel efficiency and reduces exhaust emissions by offering high power levels using lightweight actuation devices. Because of the wide circulation of fluid with hydraulic actuation, fluid degradation can have a major affect on many different parts. Micro oil passages in the cylinder head, oil control valve and cam phasers can quickly become clogged with sludge. Sludge and varnish cause hydraulically actuated cam phasers to stick in advanced or retarded positions. When these intake and exhaust valves are open at the same time, hydrocarbon deposits can form on intake port walls. All of this deposit buildup causes noticeable drivability and performance decline. The purpose of piston rings is to build compression and prevent fuel and combustion gases from “blowing down” past the piston and oil vapors from seeping up into the cylinder. Low tension piston rings buckle under extreme pressure and have a greater tendency to allow blow-by. Blow-by means that gasoline enters the crankcase resulting in oil degradation. Oil-based deposits are also being found in the combustion chamber. The result is deposits baked on piston tops and injector tips. Add a turbocharger or supercharger to an engine with low tension piston rings and deposit buildup multiplies pandemically. These power boosters put a ton of extra pressure on the internal combustion process, which directly affects the job requirement of the piston rings. When additives are depleted in the oil, it can no longer protect like it’s meant to. Deposits are a detriment to low tension piston rings. With such low spring force, the smallest amount of deposits quickly impedes ring movement. Stuck rings allow copious amounts of fuel and combustion gases to enter the crankcase, increasing crankcase temperature and pressure. This promotes excessive oil loss and deposit formation. In Gasoline Direct Injection (GDI) engines, gasoline is sprayed directly where the combustion chamber is the hottest (instead of in the air intake) to allow for a more thorough, even burn. Ideally, a more complete combustion burn translates to better mileage and greater power. In a port fuel injection engine, deposits can be “washed off” the backs of intake valves by a constant stream of gasoline in the intake. However, in a GDI engine the injectors spray inside the cylinders. Without port injectors spraying gasoline (and the detergents that it contains) onto the backs of intake valves—intake components can quickly become caked with hydrocarbon deposits, restricting airflow. GDI engines also run at much higher PCV and cylinder pressures, which in time, can allow oil vapors to pass by the piston rings. Oil vapors circulate into the cooler regions of the engine, creating deposits and pooling. Some of those areas include intake boots, valves, piston crown, head squish area and catalytic system. A combination of sticky deposits and oil evaporation can lead to carbon buildup in several places in the engine. Rock hard carbon buildup fouls injectors and can dislodge and cause irreversible damage to cylinder walls and catalytic converters. In just a few thousand miles, GDI engines have seen significant performance and MPG losses. Rapid innovation—variable valve timing, hydraulic actuation, low tension piston rings and gasoline direct injection—answers the consumer call for, “We want it all!” But while exciting and solution-oriented, rapid innovation has its flaws. At BG we know that with innovation comes opportunity. That, and it’s not always possible to have your cake and eat it too. Inherent problems, with each of these technologies, affect the oil and fuel systems. The simple answer is that these problems can be avoided with three BG products. Thoroughly clean the piston rings (BG EPR®). Fortify the oil to resist breakdown (BG MOA®). Keep the fuel system deposit free (BG 44K®). 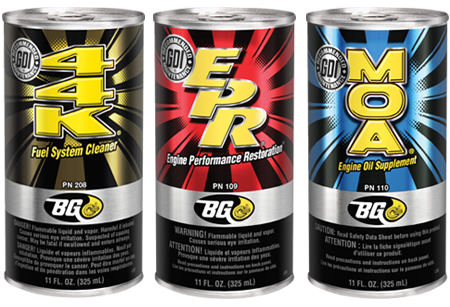 These three products make the BG Performance Service BG’s most powerful maintenance service! The BG Performance Service will prevent deposit buildup and keep new technologies operating at maximum efficiency. For a copy of the complete BG Products GDI Vehicle List please visit our Google Drive. Please note this file is over 50 pages long so you may prefer to bookmark the list instead of printing it. To make it easier on our clients we have recently uploaded masters of BG’s Service Sale Sheets to our Google Drive. BG of Tidewater Customers can download these PDF’s and add their own pricing to BG Service Sale Sheets. This will allow clients to also print and display service sale sheets quickly and efficiently. Please know each service is it’s own PDF and except for adding your personal pricing to them the sheets can not be modified in any way. Press Release from BG Products- WICHITA, Kan.–May 12, 2015 –BG Products, Inc., introduces the new BG DPF & Emissions System Restoration Service designed to clean and improve the smart exhaust system of modern diesel engines, including the Diesel Particulate Filter (DPF). The first of its kind, it allows technicians to not only command DPF regeneration, but to control it for a thorough DPF cleaning. Additionally, this unique service restores fuel efficiency, reduces emissions and restores horsepower and overall engine performance. While DPFs and other after treatment devices are effective in reducing harmful emissions, they are susceptible to deposits that greatly diminish their effectiveness and can cripple diesel engine performance. Diesel exhaust flows through the DPF, where soot and larger particles are captured allowing only filtered exhaust gases to pass through. When the DPF soot level reaches a certain point, the engine management computer (ECM) initiates fuel injection during the exhaust stroke, to increase exhaust temperature and trigger regeneration. Regeneration is the method in which the DPF “cleans itself.” During regeneration, exhaust temperatures must become hot enough to burn built-up soot off the DPF. To have the BG DPF & Emissions System Restoration Service performed on your vehicle, find a shop near you that offers it at bgfindashop.com. To get the BG DPF & Emissions System Restoration Service at your location, contact your local BG Distributor at bgprod.com/distloc. 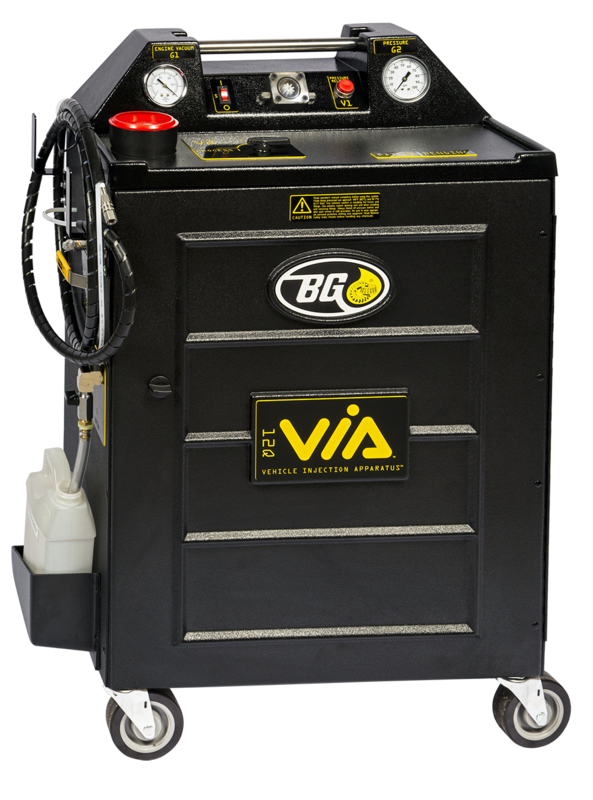 BG Products, Inc., introduces BG On The Road®roadside assistance with five new benefits and a longer coverage period for BG customers. BG On The Road® now offers all of the following benefits. 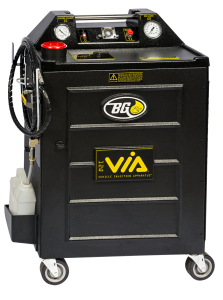 As always, BG On The Road® roadside assistance is complimentary with the purchase of BG Automotive Maintenance Services. BG On The Road®roadside assistance is available in the U.S., Puerto Rico and Canada and is limited to two events for six months. For more information on BG On The Road® roadside assistance, visit www.bgprod.com. GDI stands for Gasoline Direct Injection, but that’s not all. To BG, it stands for opportunity. Gasoline direct injection engines are nothing new. The first automotive GDI engine was introduced in Germany in the 50s. The GDI engine boasts more power with increased fuel economy. At the time, fuel and oil were cheap and the need for fuel-saving engines wasn’t significant. Manufacturers didn’t aggressively pursue GDI engines until the early 2000s. Today, CAFE regulations put a lot of pressure on manufacturers to revolutionize vehicles and meet stringent fuel economy and emissions requirements. As a result, many manufacturers are turning to GDI, coupled with other engine technologies such as turbocharging, to produce a vehicle with small-engine efficiency and big-engine power. GDI is the answer for OEMs! GDI engines offer increased fuel economy, power and performance, all while reducing emissions. They are significantly more efficient than port fuel injection (PFI) engines. For example, in a GDI engine, gasoline is sprayed directly where the combustion chamber is the hottest (instead of in the air intake), allowing for a more thorough, even burn. Ideally, this more complete combustion translates to better mileage and greater power. GDI engines burn leaner than port fuel injection engines (GDI 40:1 vs. PFI 14.7:1). A leaner mixture allows fuel to be burned much more conservatively. GDIs have accurately controlled emissions levels, more aggressive ignition timing curves, and more precise control over fuel and injection timing. As the saying goes, “If it sounds too good to be true, it probably is.” And the same goes for GDI engines. As with most complex technologies, with the benefits, complications may occur. New vehicles with GDI engines have seen significant performance and mpg losses, ignition failures and fouled injectors in as early as 3,000 miles (4,800 km) and, potentially, holes from carbon burned in the structure of the catalytic converter in as early as 50,000 miles (80,000 km)! What’s causing all these GDI engines to have complications so soon? In most environments, intake air is dirty due to pollution, and with modern exhaust gas recirculation systems and crankcase vent systems—and without port injectors spraying gasoline (and the detergents that it contains) onto the valves—GDI components can get filthy over the course of many thousand miles. GDI engines run at much higher cylinder pressures, which in time, can pass by the piston sealing rings. The heat and pressure released into the crankcase accelerates oil vaporization and eventually distributes oil droplets onto the intake valves. Thus, intake valves collect deposits and in as little as 10,000 miles (16,000 km), they can bake on and cause a decrease in power and poor drivability. 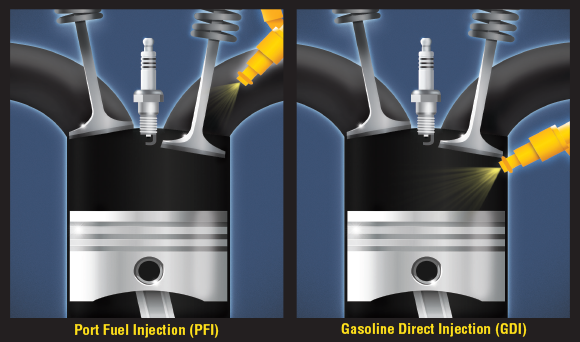 Since inception, GDI engines have had known problems with coking—buildup of cooked fuel deposits that foul injectors. The high operating temperatures of GDI engines can lead to engine oil evaporation. Oil vapors circulating in the cooler regions of the engine create deposits and pooling. Some of those areas include intake boots, valves, piston crown, head squish area and catalytic system. In a port fuel injection engine, these droplets are “washed off” the intake valves by a constant stream of gasoline. However, a GDI engine does not have that advantage because the injectors spray inside the cylinders. Deposits are like a sticky coating of oil that forms especially on the intake ports and valves. Carbon buildup on the backsides of valves can result in reduced airflow. A combination of sticky deposits and oil evaporation can lead to carbon buildup in several places in the engine. These sticky deposits can be cooked to diamond hard deposits and can dislodge and cause damage to turbochargers, catalytic converters, etc. These hard deposits can also cause irreversible cylinder scoring. With many complex technologies, BG has a simple, effective solution. Usually a pour product or a piece of equipment can keep the engine clean and deposit-free. GDI engines, however, have proven to be a little more challenging. For example, in port fuel injection engines, the injector sprays fuel on the back of the valve. Thus, adding a fuel system cleaner to the fuel will clean deposits from the backs of valves. In GDI engines, however, because fuel is sprayed directly into the combustion chamber—and not onto the back of the valve—it’s very difficult to get the backs of the valves clean, without a lengthy teardown. That sounds like an opportunity to BG! 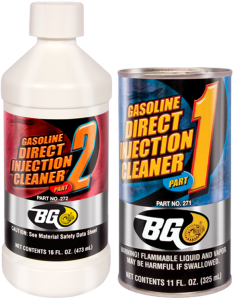 BG has a two-pronged approach to potential complications in GDI engines: the Clean Up and the Keep It Clean. The Clean Up is for the GDI engines that have accumulated many thousands of miles and have the deposit buildup to prove it. While it’s in depth, it’s nothing compared to the complete teardown in which many service departments are elbow deep. 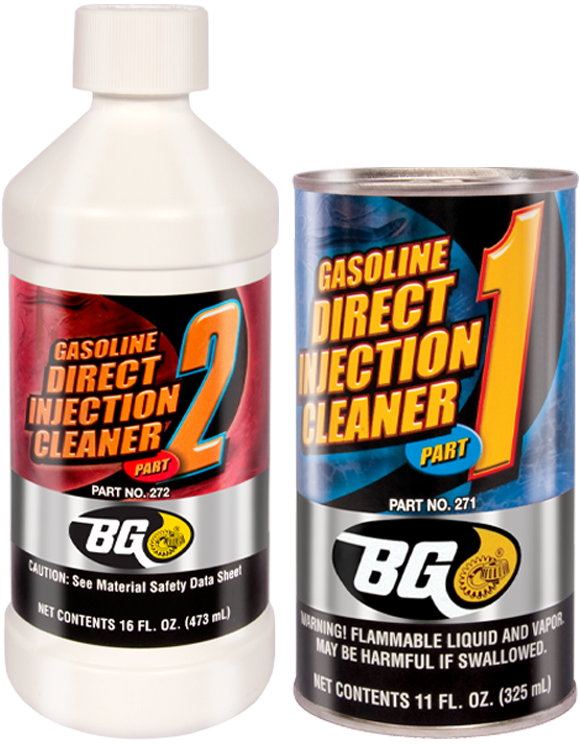 BG Gasoline Direct Injection Cleaner, PNs 271 and 272, is a two-part process formulated to quickly soften and disperse baked-on deposits, which accumulate on the intake valves of direct-injected engines. With the Gasoline Direct Injection Service Tools, PN 9060, the technician can remove harmful deposits without the complete disassembly that’s typically required. Once the GDI engine has been cleaned up, it’s imperative to keep it clean to avoid continuous deposit buildup. The BEST way to clean these tough-to-remove deposits is to avoid them in the first place. The Keep It Clean approach packs a punch with three of BG’s most effective products. The BEST way to do that is with the BG GDI Performance Service at each oil change interval. BG EPR® Engine Performance Restoration, PN 109, softens and dissolves hard-to-remove deposits from piston rings. Compression will begin to increase in as little as 10 minutes! Properly sealed combustion chambers improve compression, reducing oil dilution through blow-by, which is typical in GDI engines. BG EPR® will restore lost fuel economy and power. BG MOA,® PN 110, engine oil supplement prevents engine oil thickening under even the most severe driving conditions. It fortifies all qualities of engine oil to help withstand fuel contamination and maintain essential lubrication qualities longer under extreme temperatures. It keeps ring lands, hydraulic cams and lifters and other engine components clean. BG 44K,® PN 208, fuel system cleaner quickly and effectively cleans the entire fuel system. BG 44K® provides quick cleanup of carbon-covered piston tops, fuel injectors and other crucial combustion areas. Because it provides efficient removal of upper engine deposits, it reduces problems caused by deposit buildup such as engine surge, stalling, stumble, hesitation and power loss. 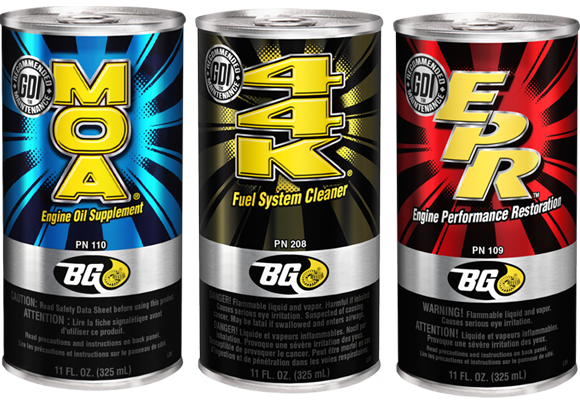 BG 44K® quickly restores engine performance and improves drivability. Together these three products have been proven to keep GDI engines clean and prevent potential complications. So when manufacturers turn to new, complex technologies like GDI for better fuel economy and lower emissions, BG knows that GDI stands for opportunity. And BG seizes that opportunity to make GDI engines last longer and perform even better so that drivers can enjoy the significant benefit of these highly complex engines.